Heartbreaking footage has emerged of two young boys mourning the death of their brother after he was killed in an air strike in Syria. The barrel bomb struck the Aleppo suburb of Bab al-Nairab in a horrific attack on Wednesday, leaving a total of 15 people dead, the Mirror reports. 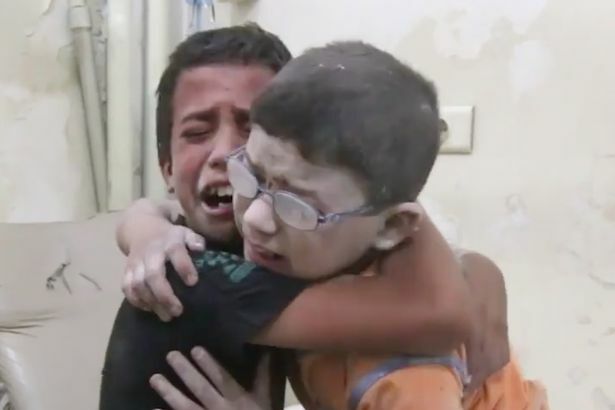 The boys cry and embrace each other in the shocking footage, taken in a hospital and posted online by Syrian news outlet Aleppo Media Center. It is just the latest chilling reminder of war’s horrors. Last week, the picture of a dazed and bloodied boy in the back of an ambulance went viral as a symbol of Syria’s civil war. Five-year-old Omran Daqneesh was one of five children injured during an air strike. His brother died shortly after the photo was taken. Further images – many too graphic to publish – also highlight the tragic aftermath of the strike, with parents pulling their babies and children from the rubble. Along with numerous protests in the UK against Syrian airstrikes, the last doctors in the rebel-held east of the Syrian city of Aleppo have urged US President Barack Obama to cease-fire. A letter signed by 15 physicians warned that if attacks on hospitals continue at their present rate, there could be none left within a month. Unfortunately, if the world’s leaders do not listen to the public outcry, there will be more air strikes tomorrow and more children will be killed. Our hearts go out to everyone affected by the airstrikes.